My inspiration to write comes from love of storytelling propagated from a lifetime in books. 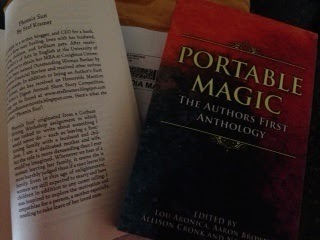 So when my story, Phoenix Sun was selected to be published in the 2014 Author's First Short Story Contest, I didn't realize how much of my reward would come from reading all of the winning stories in the published anthology. Portable Magic is composed of seventeen broadly original pieces which dip into everything from mythology, dystopia, and tragic-comedy. While each writer certainly has his or her own distinct style, I feel the editors deserve high praise with the palpable synergy that exists between each tale. There's a particular cadence to the entire anthology with its mix of surreal and real, long and shorter stories. Perhaps it's the verbal felicity of each of the writers–the enjoyable prose. No matter where I happened to finish reading, I was always anxious to get back to the book–either to finish whatever short story I was reading or to start one anew. Textures within Portable Magic abound! Many of the stories provide extraordinary sensory details. While there wasn't a read I didn't like, I was really struck by I Fell Off My Name by Micah Juliot. The story tells of a disenchanted hostel worker in Barcelona. As we learned of the the protagonist Kamal's daily rituals, we also sensed, equally the banality and profundity of his life...his name–and his ability to choose his destiny. I also became completely enraptured by The New Fenian. B. Lynch Black artfully combined folklore into a modern day scene to create a story of enriched characters and a page-turning plot. The World was an Island was penned by Abigail Andersen, a high school creative writing student who defied conventional storytelling and brought us a brilliant narrative of pain, love, and redemption about a girl who was stuck on an island with her "lifegiver." I hope Portable Magic is the beginning of a trend to revive contemporary short stories in an art form as something more enriching than a high school or college assignment. (The style certainly works well with our busy lifestyles.) I, for one, was pleasantly surprised how much I enjoyed each and every one the stories...even though yes, I did write one of them!